Spill Control pallets and sorbent pads to control spills. We offer Spill Control Pallets by both Justrite and Eagle Manufacture. All of theSpill Control Pallets is the answer to your spill containment issues. 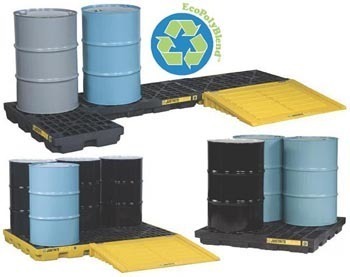 These Spill Control Pallets meet or exceed OSHA and EPA regulations. 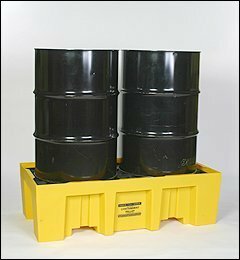 Choose from Spill Control Pallets, Spill Containment Caddies, Drum Management Systems, and many more. First Aid and Safety offers Spill Control Kits and Spill Containment Products including Oil Sorbent Pads, Chemical Sorbent Pads, Petroleum Sorbent Pads, Slikwik Socs, Spill Drum Kits, Drain Seals, Containment Berms, Dewatering Bags, Eagle Lab Packs, Overpack Drums, Spill Containment Platforms, Hazmat Drum Spill Kits, Justrite Spill Containment Platforms and many other Spill Control and Spill Containment products.